"Serpent Power is a psychedelic music collaboration between Ian Skelly (the Coral) and Paul Molloy (the Zutons) formed in 2014. After the pair discovered an instant songwriting chemistry between them at an aftershow party, they immediately booked themselves into Castle Grayskull studios in Merseyside and began work on their debut album. 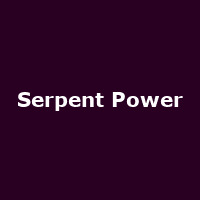 Deciding to keep the name of Ian's backing band from his 'Cut From A Star' solo album tour...The Serpent Power was born. After an intense flurry of recording activity, the album was complete; and a strange and bizarre world of warped madness had been created by the pair. Their debut album unravels like a darkly psychedelic comic horror book; with twisted tales of alien brain abduction, phantom bogeymen; sirens, voodoo witchdoctors and waitresses come serial killers to name but a few."